To anyone outside of the art world, Jury Photos is a pretty unknown term. However, as we’ve talked about, for fine artists and crafters alike, this category of photography is crucial to exposure and often, success. To get into art shows, competitions and exhibits, you need examples of your work to share with the judges, usually referred to as a Jury. This group of artists, curators and art industry professionals come together to help pick which artists should be included. 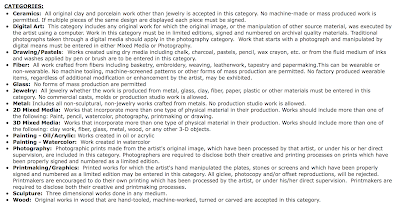 They are given a set of criteria to evaluate each submission, and in most cases, they’re only looking at the photography, a.k.a. a Blind Jury. These images need to accomplish a number of things – from showing your talent and professionalism to indicating cohesiveness of your style and fit for the category. These juries may go through hundreds of applications, so your photography has to work its magic quickly. How do you make sure your Jury Photos really shine? Whether your just starting out with juried art events or ready to improve your acceptance rate, these tips are designed to help you present your best self. While you should pick which shows to apply to by their attending demographics, know that the people judging your application aren’t necessarily your customers. They are peers and other art professionals that will evaluate you on other terms. In most cases, they’re looking for craftsmanship and quality first. Does your work meet or exceed the expected caliber of the event? They will then look for how your work goes together and whether or not you fit the category, among other factors. Each show has its own requirements, so be sure to read the application thoroughly. Most shows will also tell you who's on the jury if you want to do a little research on their tastes. Don’t just show pictures of your best sellers; show the best of the work you plan to bring to the event. As I mentioned, it’s important to read the event application fully before applying. Know the requirements, costs, deadlines, expectations, and for your photos, be sure to follow the specs. Having the right file size and type seems minor, but it can determine whether or not your application goes through. Use the recommended resolution, aspect ratio, dimensions and naming convention because photos that don’t follow these may be rejected merely on those grounds. Most shows get so many submissions, they have to move through them very quickly. If your images aren't the right size or shape, they may just skip you. Moreover, the jury usually reviews your submission on their computer monitor, so the images need to render properly to be viewed and judged. File Type – Usually jpg. Image Size – Minimum & maximum in MB. Aspect Ratio – Recommended shape. Dimensions – Width & height in pixels. Resolution – Image quality in pixels per inch. You may have the best photos in the world, but if you apply under the wrong category, you can seriously hurt your chances to get in. Fit is among the key characteristics and the jury has to rate your work based on how the show divides up different media. Be sure you review the breakdown. If you're not sure, look at past year's artists and how they are grouped. If you have more than one specialty, you will likely need to apply separately. That's why most shows allow you to submit more than one application. Depending on the other submissions, you may be approved for one medium and not the other, so it's important to be strategic as well. I mean this literally and figuratively. Your photos need to be in focus first and foremost. Blurry images won't do your work justice, and they reflect poorly on your professionalism. Since the jury isn't seeing your work in person, your photography needs to be as high quality as possible so they feel confident the work will fit the show. In a less literal sense, it's also important to make it clear what the jury is supposed to look at. In most cases, you only want to include your work in the composition so the judges can focus on what you're presenting. If you do have any props or staging, make sure they don't distract. Save staging for product photos. Generally speaking, simple images make a better impression. The jury may have hundreds of applications to flip through. Your photos need to make the artwork pop. Avoid complicated scenes with lots of props or more than a few pieces together because that's hard to dissect quickly. It's ok to show a range of work or a collection, but be mindful of how much is too much for one shot. 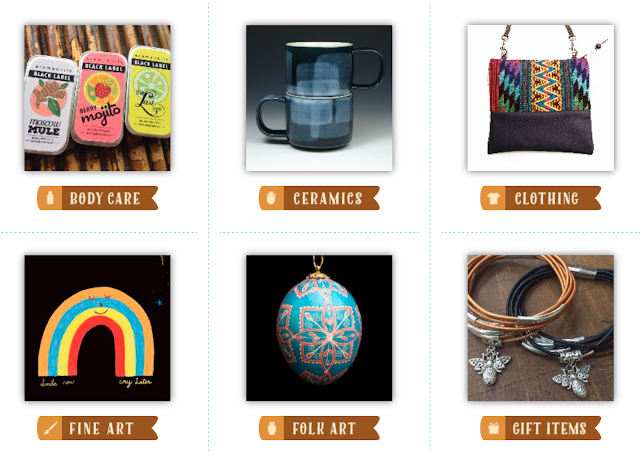 I recommend under five items, but most images should have just one piece of artwork each. Applications commonly ask for three jury photos, so you have the chance to feature a variety. I was tempted to say “Lighting is everything” because in photography, there are no images without light. When it comes to jury photos, good light ensures that your images stand out and that your craftsmanship can be seen. If your images are too dark or too bright, the details are lost. Plus, much like blur, poorly lit shots look unprofessional. You need to invest in a strong, quality presentation to demonstrate that you will be a good fit for the show. If you hire a professional photographer, they will know how to light your work to show depth and dimension while avoiding glare and unflattering shadows. If you prefer to photograph your work yourself, opt for a diffuse light source and plan to make sure adjustments for consistency. Learn more about the importance of lighting here. When an application asks you to submit multiple photos, they are giving you the chance to show different pieces, but know that the jury will be looking for a consistent style and a cohesive collection. Be sure that they pieces you feature in your jury photos work well together. 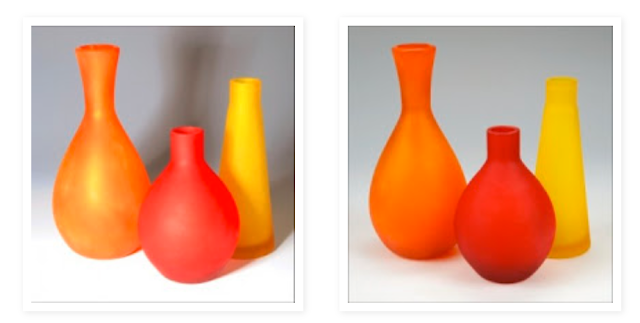 That doesn't mean only photograph one type of your artwork, but be mindful of whether or not you have a strong grouping. This helps to jury imagine how your booth will come together, and it plays into the professionalism. If you have more than one specialty, be sure you apply separately for each. 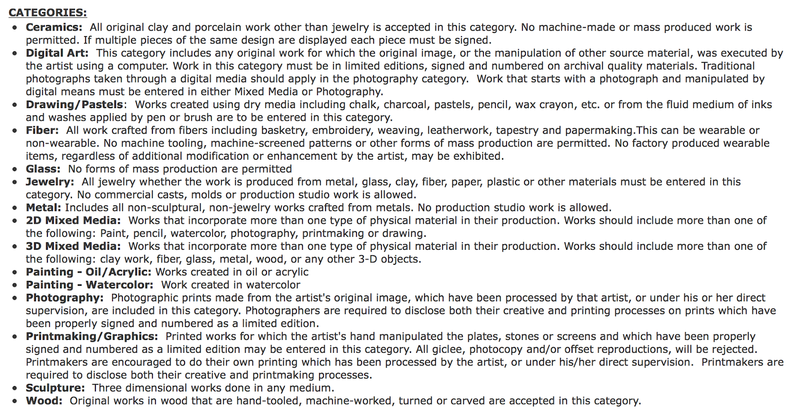 For example, if you paint, but also make jewelry, you need to break up your submission by category. On the other hand, if you are an illustrator and you offer reproductions of your drawings in different formats like prints, jewelry, scarves, notecards, you can stick with one application because your style should bring together all of the different pieces. As I mentioned above, if you're not sure what category you fit into or you want to see who the jury has picked in previous year's, look at the art event roster. This is especially helpful to categories like Home Goods that could encompass many things. Most art events will have the list up on the website through the application period until they announce the next show's artists. You can see not only the range of artists, but also how they featured their work. While not every one of them will be a good example, this is a place to start. In most cases, the photos you submit to an art show application will also be used for marketing the show. As such, the better your images, the more likely you are to be featured in these materials. While everyone may get a listing on the website, only the best are also included in print and digital advertising. They show will choose based on what represents the event well, and good quality photos are key. Some applications will actually tell you which of the photos will be used for the website and such, so make sure you choose the strongest for this submission. While being a creative entrepreneur can feel like you're all alone, don't forget about all the peers you have that can help you. Don't be afraid to ask. If you're not sure about which images to submit or whether you need to hire a professional photographer, you can talk about these decisions with a mentor or a fellow artist who likely has valuable input and experience to share. If you don't have someone in the industry to consult, it's ok to talk to friends or family, but know that they will have a different perspective. Consider getting a couple opinions to help guide you. I hope these tips get you thinking about your images and how best to show off your work. The overall goal is making sure your jury photos clearly demonstrate your talent. Don't let poor photography hold you back. You can see more examples of jury photos on the Crafting Exposure website. Feel free to reach out if you need help!